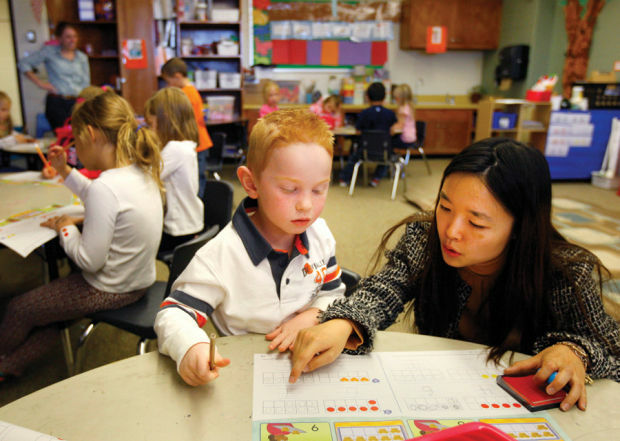 Mandarin immersion program grows in Casper, Wyo. Chinese and English: Dual language program grows in Casper, Wyo. Kindergarten teacher Anastasia Lite Li works with student Sterling Mann in a dual-language immersion classroom last month at Paradise Valley School in Casper, Wyo. CASPER, Wyo. – Anastasia Lite Li is a soft-spoken woman until her students enter the Chinese classroom. That’s when the 24-year-old Beijing native with a master’s degree in teaching Chinese as a second language comes alive. Students in this kindergarten class at Paradise Valley Elementary in Casper know the drill: When the bell rings, the English ends. Their names are printed in English on strips of masking tape on a carpet near the back of the room, but little else is said or shown in English in Li’s classroom, which is the first of its kind in Wyoming. It is not a special program for gifted students, nor a language curriculum like what is offered in high schools across the state.